Healthy Heart Support™ Tea, 2 1/2 oz (Nature's Wonderland) - Penn Herb Co. Ltd.
Of all the muscles in your body, your heart is the most important and the hardest working. 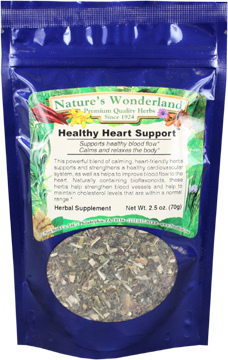 This powerful blend of calming, heart-friendly herbs supports and strengthens a healthy cardiovascular system, as well as helps to improve blood flow to the heart. HAWTHORN BERRIES…rich in bioflavonoids, which help strengthen blood vessels and support healthy blood flow throughout your body. MOTHERWORT...this cardio-tonic pulls triple duty as natural stress reliever and healthy blood pressure support. SCULLCAP, VALERIAN…calms, relaxes and eases stress on the heart. BORAGE, TANSY...traditional herbal heart helpers provide added support. Keep Your Most Important Muscle Healthy…and Going Strong! Pour 8 oz of freshly boiled water over 1 heaping teaspoon of tea. Cover and allow to steep 4-7 minutes, then strain. Drink 2-4 cups daily. To enhance flavor, add honey, stevia and/or lemon to suit your personal taste. SEE PRODUCT LABEL FOR CAUTIONS.